I love fun Christmas traditions and am always trying to find new ways to make it magical for the kids. This year we’re doing fewer organised events and more unplanned moments, thanks to last year’s kicking and screaming trip to see Santa in the pouring rain! But there are still a few traditions that we can’t miss, and we look forward to year on year. If you’re looking to add a few more to your repertoire, here are some festive ideas to add a little more magic to the holidays. A delicious, sugary breakfast to get everyone in the Christmas spirit, kids – and elves if you have them – are guaranteed to love a North Pole Breakfast. You can go all out on the decorations with a Christmas tablecloth, confetti, balloons and crackers, and even set little early Christmas presents at each place. There are some great ideas for food here, including strawberry santas with fresh cream, and fresh fruit Christmas trees. Hot chocolate would be fun, perhaps served with a candy cane or gingerbread man. We do this instead of an Elf on the Shelf or a Christmas Eve Box. 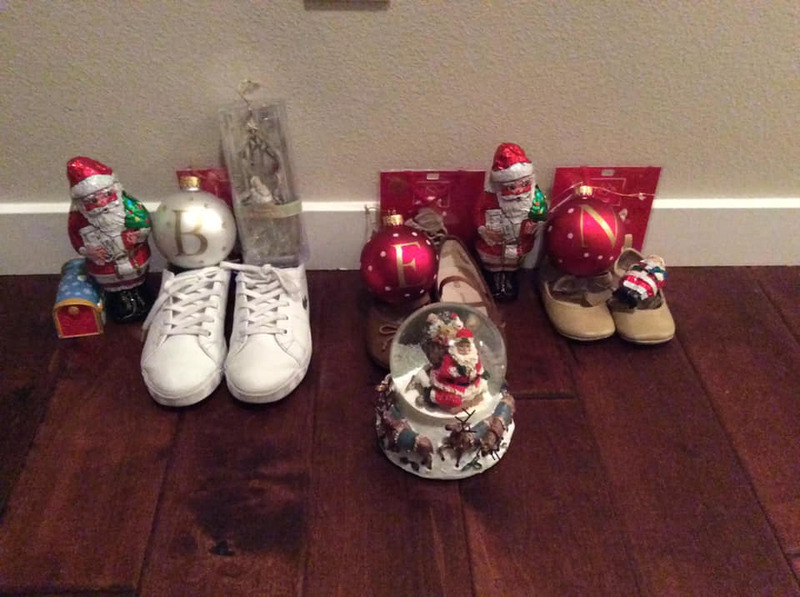 It’s adapted from the St Nicholas Day tradition where children leave their shoes out on December 6 and wake to find St Nicholas has filled them with chocolate coins and other small treats. In our house, it’s an elf who visits for just one night and fills the shoes, usually adding some Christmas books and PJs. This year he will leave behind an ornament for the Christmas tree and a wooden nativity scene. It gives the kids more time to use the Christmassy stuff and gets us out of doing a proper elf; win win! When your kids are least expecting it (preferably when they’re in their jammies), bundle them into the car and drive round to find the best and brightest Christmas lights. You can even make them tickets to make it a Polar Express type journey, and take blankets so they’re extra snuggly. If they haven’t brushed their teeth, a sneaky hot chocolate before bed would go down a treat. We like to give everyone a turn with stirring the Christmas cake mix so they can make a special Christmas wish. Even the baby had a turn this year – and tried to eat the spoon! 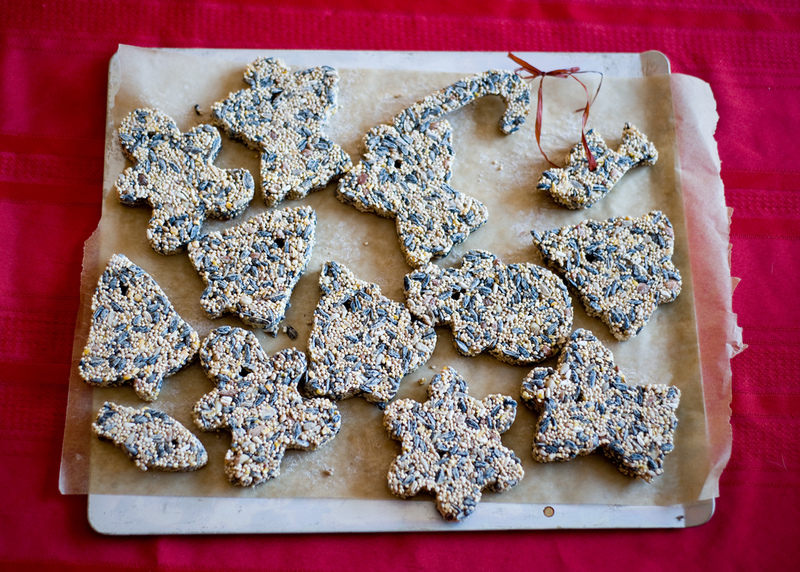 If you’ve got a pretty tree outside, have the whole family decorate it with edible ornaments for the birds. You could use pine cone feeders, suet balls – using cookie cutters to make them into Christmas tree shapes, snowmen or baubles – and strings of fruit, like cranberries or orange chunks. There’s a great article about it here. Doing the Christmas shoe box appeal really helps my kids appreciate that there are families less fortunate, and that Christmas is about giving. I’d like to expand on that next year and have them give some of their time, as well as money. This could be doing a good turn, or volunteering in the community. You could also let them choose toys they don’t need anymore to donate to charity. As well as making room for new things, it means people can buy great toys from charity shops to use as Christmas gifts, instead of donating them in the New Year. A throwback from my school days, but a Christingle orange makes a beautiful decoration and is fun to do together. Red ribbon or red sticky tape. Fasten a red ribbon or red sticky tape around the middle of the orange. Cut a small cross in the top of the orange. Put a piece of foil over the cross. and push a candle into it. Press the sweets and raisins onto the cocktail sticks, making sure they cover the sharp points and push them into the orange around the base of the candle. Halifax Minster holds three Christingle services on Christmas Eve. We like to do salt dough because it’s easy for the little ones. Once we added cinnamon and it smelled divine! 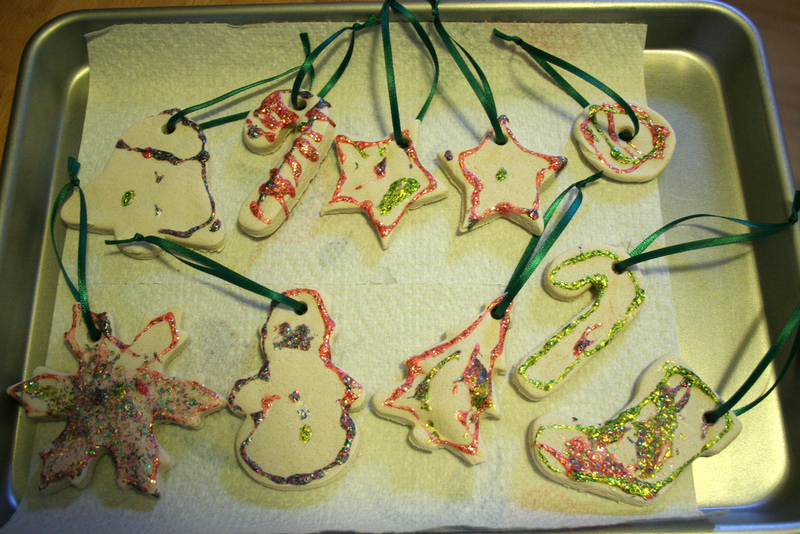 Once they’re baked and glitter added, they make lovely, sparkly gifts, especially if you incorporate a hand or foot print too. To make salt dough, mix 300g plain flour, 300g salt, 200ml water and a teaspoon of oil and kneed until smooth. Cut out the shapes and bake for 20 minutes on 180°C. Do you have a fun Christmas tradition? Tell us all about it in the Calderdale Mumbler chat group.